Two Sunday’s ago Peyton Manning and the Broncos were riding high after an opening night win over the Steelers. Just 14 days later, and a lot of luster is now off that 12-point win. Sunday vs the Texans, Manning and the Broncos were beaten early and often, falling behind and by the time it was over their rally fell short, losing to Houston 31-25. Matt Schaub threw for 290 yards and four touchdowns, going 17-of-30 passing with an interception. Houston RB Arian Foster rushed for 105 yards on 25 carries, helping the Texans (3-0) open the season with three straight wins for the first time in franchise history. Foster added a 3-yard touchdown catch, while Kevin Walter, Andre Johnson and Owen Daniels each added a scoring reception in the victory. Manning threw for 330 yards and a pair of fourth-quarter scores, but ended up with a career-high 26 incompletions on 52 passes as the Broncos (1-2) saw their late charge fall short to send them to a second consecutive loss. “Any time we’re throwing incomplete passes, that’s a we thing. We got to find a way to move the chains,” Manning said. It’s the 64th time that Manning has thrown for at least 300 yards in a game, surpassing Dan Marino’s record for the most 300-yard passing games in NFL history. Eric Decker hauled in eight passes for 136 yards, while Brandon Stokley added six catches for 73 yards and a score in the setback. Trailing 31-11 to start the fourth quarter, Denver took advantage of a Ben Tate fumble at midfield to get back in the game. 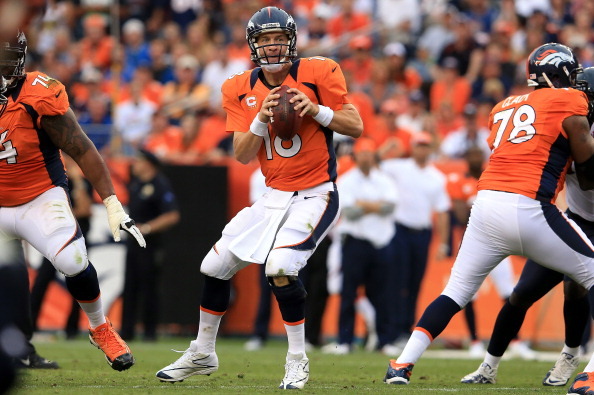 Manning hit Stokley two plays later for a 38-yard touchdown to bring the home team within 31-18. After a Houston three-and-out, Manning manufactured a 16-play, 74-yard trek, capping the drive with a 6-yard TD strike. His pass was intended for Decker in the front of the end zone, but it was deflected into the air and landed in the hands of Joel Dreessen for the score with 3:05 left. Denver elected to kick it deep and after two short gains from Foster, Schaub hit Johnson for 12 yards and a new set of downs. Denver stopped Foster on three straight plays to force a punt with 33 seconds left, but Denver’s hook-and-ladder play as time expired was unsuccessful, allowing the Texans to escape with the victory. “We let them back in the game with the fumble there in the fourth quarter, but we had the character to still find a way to finish the game and get out of here with a win,” Houston coach Gary Kubiak said. The Broncos punted on their opening drive, but pinned the Texans at their own 6-yard line. Schaub dropped back to pass on Houston’s first play, but was sacked in the end zone by Elvis Dumervil to give Denver a 2-0 lead. Matt Prater buried a 32-yard field goal on the ensuing possession before Schaub answered with his first TD strike of the afternoon. The Houston signal caller hit Walter for 18 yards and, after back-to-back false start penalties, found Johnson streaking down the middle of the field for a 60-yard touchdown pass to give Houston a 7-5 lead. After a Denver punt, Schaub put together a lengthy 14-play, 97-yard march. He hit Keshawn Martin for 18 yards on 3rd-and-11 before connecting with Garrett Graham for 27 yards down to the Denver 4. Three plays later, Schaub found Foster slipping out of the backfield for a 3- yard TD catch to extend the margin to 14-5. Houston forced another Denver three-and-out, and Schaub hit Walter for a 52- yard touchdown on the second play of the drive to take a 16-point lead. Prater connected on a 23-yard field goal on Denver’s ensuing possession and then added a 53-yarder in the closing seconds of the half to bring the Broncos within 21-11 at the break.